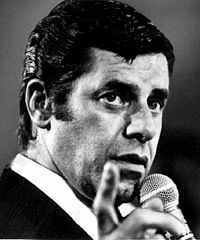 A scant 4 years after removing Jerry Lewis as the host of the MDA telethon, the telethon is now going off the air. The Muscular Dystrophy Association is ending its annual Labor Day telethon, a television tradition for decades that has slowly disappeared from view since the sudden end of Jerry Lewis’ role as host following the 2010 show. The telethon was a relic from a different age, a tuxedoed Lewis oozing show biz schmaltz and hosting stars from Frank Sinatra to Jennifer Lopez over 45 years, pushing through his exhaustion to sing “You’ll Never Walk Alone” as a tote board rang up millions of dollars in donations. From 21 and a half hours in Lewis’ final year, the show had been reduced to two hours the last two years on ABC.